A little over a year ago, we talked about NVIDIA and its AI processing technology that was working to create realistic-looking human faces from a few source photos. The images that the AI created were so photorealistic that you would be hard-pressed to tell the difference between the AI generated faces and real human faces in photos. The technology has come so far in the last four years that the difference is now even more astonishing, and frankly a little creepy. 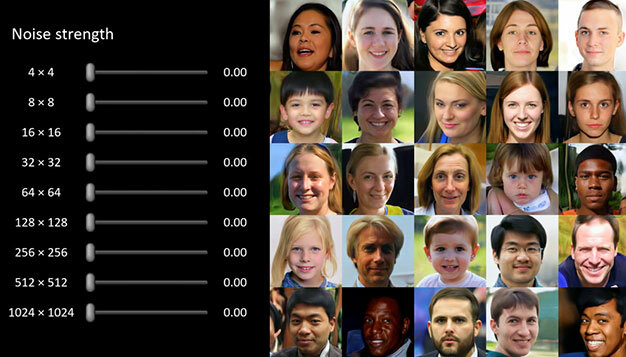 The image above (b) shows the faces that a similar AI was able to generate in 2014, while the photo below this paragraph shows the faces the AI can create today. The AI-rendered faces are so good that if you weren't told that they were produced by a computer, you would probably assume they were real people. These AI-generated faces promise to usher in a new generation of photorealistic human renderings in video games and movies, without the need for human actors or extras. 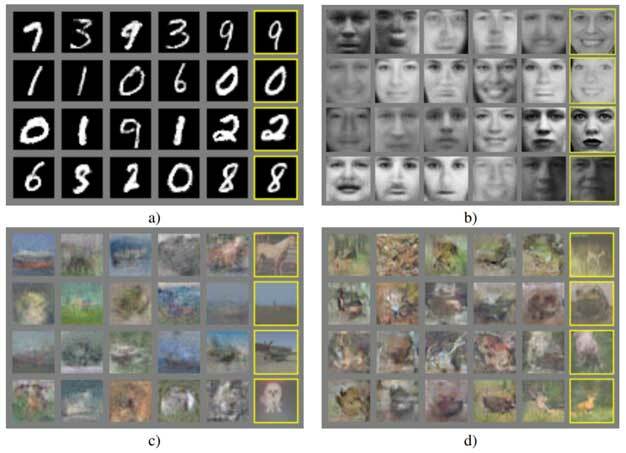 NVIDIA researchers modified a basic Generative Adversarial Network or "GAN" architecture to create the images in the latest research (PDF). GANs work on the premise of a Generator neural network working with a Discriminator network, to iterate on whether data generated (by the Generator) represents an authentic version. The faces generated by the AI are said to be easily customizable using a method called style transfer that blends the characteristics of one image with another. This is similar to how some apps on Facebook work, such as those that make photos look like impressionist paintings. When the style transfer is applied, the AI can generate images that look like completely different people. With AI getting so good at creating fake images, some fear that the tech might erode the trust people place in pictorial evidence. Researchers working on this sort of tech point out that you can't change any image you want with the same fidelity. Creating the fakes takes time; the NVIDIA team says that it took a week to train their model powered by eight Tesla GPUs (basically a small AI server/supercomputer). Human hair is said to be the most likely giveaway of an AI generated image, because it's hard to fake and often looks painted on. You can see that in some of the NVIDIA-generated images, but some of them look near-perfect. If the AI-generated images have come this far in four years, people critical of the tech have to be wondering what the fakes might be like in another four years, and where this will lead us in the future.